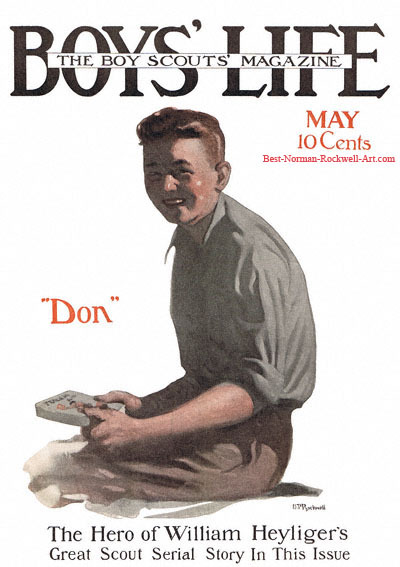 Don Strong, this Norman Rockwell painting, appeared on the cover of Boys' Life published May 1915. An alternate title for this painting is Laughing Boy. This was Rockwell's tenth cover publication. Long before the Boy Scouts magazine published this painting on its cover, readers had become familiar with him through his article and story illustrations and also other cover illustrations. Rockwell had been hired as the art director of Boys' Life in 1913. By 1915, young 18-year-old Rockwell was very comfortable and confident in his position. Boys' Life was still a fairly new publication at this time. The first issue was just published in 1911. However, both Boy Scouts and Boys' Life had become firmly established in American culture by 1915. Both would become American cultural icons. And Rockwell was well on his way to his future icon status as well. In this issue, Boys' Life started a new six part serial entitled Don Strong of the Wolf Patrol. The serial was written by William Heyliger and illustrated by Norman P. Rockwell. The story was also published in book form, although with much fewer illustrations. This Rockwell cover illustration of the main character kicks off the series. It is signed N P Rockwell in the lower right corner. Rockwell had not yet dropped the "P". Don Strong is a football and baseball player. He also builds bird houses. I will not spoil this wonderful story for you. He becomes a Boy Scout in the story. He also learns along the way just what being a Boy Scout means.